Paint an image according to the pattern you see with the signature: Jesus I trust in you...... I promise that the soul that will venerate this image will not perish. I also promise victory over enemies already here on earth, especially at the hour of death.... I desire that this image be venerated, first in your chapel, and throughout the world. 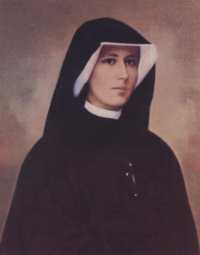 At the request of her spiritual director, Saint Faustina asked the Lord about the meaning of the rays in the image. She heard these words in reply: The two rays denote Blood and Water. The pale ray stands for the Water which makes souls righteous. The red ray stands for the Blood which in the life of souls. These two rays issued forth from the depths of My tender mercy when My agonized Heart was opened by a lance on the cross... Happy is the one who will dwell in their shelter, for the just hand of God shall not lay hold of him... By means of this image I shall grant many graces to souls. It is to be a reminder of the demands of My mercy, because even the strongest faith is of no avail without works. Encourage souls to say the Chaplet which I have given you... Whoever will recite it will receive great mercy at the hour of death.... When they say this chaplet in the presence of the dying, I will stand between My Father and the dying person, not as the Just Judge, but as the Merciful Savior... I desire to grant unimaginable graces to those souls who trust in My mercy.... Through the Chaplet you will obtain everything, if what you ask for is compatible with My will.